"Baroque" instruments are our specialty! Your repairs receive the utmost care in RMC's shop. Our certified and trained professionals are knowledgeable about your instrument, and make sure it is in the best playing condition it can be. We handle all band instruments, as well as orchestral strings. And with multiple technicians all on premises - our repairs are as speedy as they come! 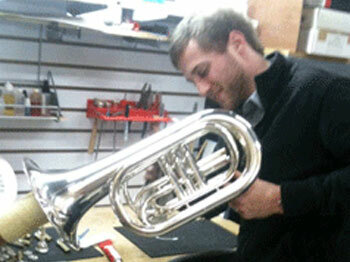 "All our repairs are done in-house, so there is never a long wait to get your instrument back. And we're here late, even before your next concert!" 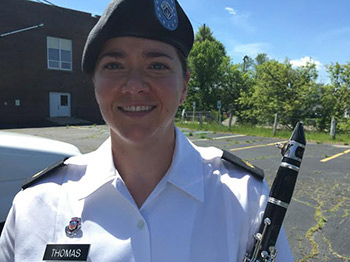 Emily is a former member of the 10th Mountain Division (LI) Band in Fort Drum, NY, and has both a Bachelor’s Degree in Music Education and Performance from Bowling Green State University and a Master’s Degree in Performance from Michigan State University. Jimmy attended Ohio University and graduated with a Bachelors of Music in Music Therapy. He is also a board certified music therapist! However, he has always enjoyed working with his hands, and finds it very rewarding to now combine his passion for craftsmanship and music together at RMC. Jimmy has been a precocious addition to our repair department and we’re thrilled to have him! Scott is a native of Eden, Ohio and trained in Instrument Repair & Construction at Red Wing Southeast Technical College. 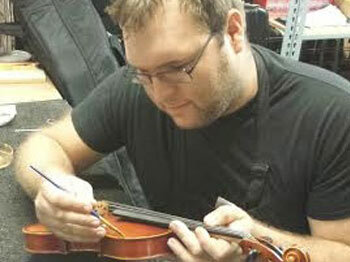 He continues to attend NAPBIRT clinics to hone his skills, and most recently has studied under Peter Horn (master orchestral luthier) on orchestral string repairs.